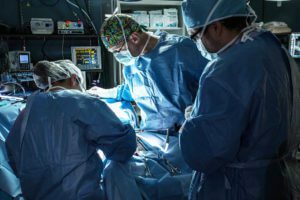 Our surgeons have years of training and use advanced technology to save lives. If your pet has an emergency or a condition that requires surgery, BluePearl veterinary specialists are trained in the latest state-of-the-art techniques. Our surgeons perform thousands of complicated procedures every year. Our surgical suites have modern equipment and monitoring capabilities. If your pet needs arthroscopic surgery, joint replacement, skin graft or any complicated surgery, our skilled team will deliver expert and compassionate care. You may ask: general practice veterinarians also perform surgery, so what’s the difference? BluePearl veterinary surgery specialists have years of advanced training in order to become board-certified. Plus, our hospitals are equipped with advanced technology to help diagnose and treat pets who need surgery. 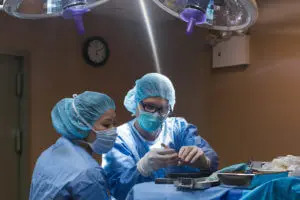 In addition, by focusing on surgery, they have the opportunity to perform procedures many times over, while your primary care veterinarian has experience in a broad range of care but may perform complex surgeries less often. Read about the knee surgery we regularly perform on dogs.